Lastly, we’ll consume the node’s data on the Pi through MQTT Subscribe and perform some data manipulation (edge computing). We'll then send the modified data through Hologram's Global Cellular Network to the cloud using Hologram's Nova, Python SDK, and Data Engine. At the bottom of the config file comment out the audio setting and add the three additional settings. dwc2 allows ethernet over usb and the other two settings disable the onboard LED to conserve energy. Save the file by typing in Control-X then Y then return. Add modules-load=dwc2,g_ether (after rootwait, before quiet). Save the file by typing in Control-X then Y then return. On Windows we'll need to setup the RNDS driver to gain the SSH functionality. Your Pi is accessible through SSH, but it still does not have access to the internet. Without the internet, we're not able to update the Pi or install any additional libraries required by this tutorial. Open System Preferences, select Sharing. Configure RNDIS Gadget to share your WiFi connection. After reboot SSH back into the Pi. It should now have internet. Open Network Connections, right click on the connection you want to share and select Properties. Select the Sharing tab, check Allow other network users…, from the drop-down select the connection of the Pi RNDIS Gadget. Putty into the Pi and reboot. Alright, we should have an SSH session going. In the terminal run the following to bring up the Raspbian Stretch configuration. These config changes will require a Pi reboot. Just start another SSH session once the Pi becomes available again. NOTE: to conserve energy we are disabling Raspbian's UI (Pixel) and only allowing the console. To work as an access point, the Raspberry Pi will need to have access point software installed, along with DHCP server software to provide connecting devices with a network address. IPTables will give us the tools we need to manage multiple connections. The iptables-persistent package ensures the right settings are set during startup. Two config screens will prompt you, say Yes to both. Next, we need to setup DHCP since the Pi will be managing local IP addresses of the nodes. Add these lines at the bottom of the file. Bring down the local wifi in case you have it up right now. Now point the startup Daemon to use this configuration file. The NAT determines how to move data between the network interfaces and allow multiple clients to connect to the WiFi. Find net.ipv4.ip_forward=1 and uncomment it. Save the file by typing in Control-X then Y then return. ➜ sudo sh -c "echo 1 > /proc/sys/net/ipv4/ip_forward"
➜ sudo sh -c "iptables-save > /etc/iptables/rules.v4"
Run the following two commands to verify things got set. Let's reboot to allow everything to execute. Start a new SSH session after reboot. Let's log back into the Pi and fire up the Access Point. Now, from another device, you should see a new WiFi network and be able to log-in. If not then go back to double check your work. Devices within the vicinity of the Pi can connect to it through WiFi. On the Raspberry install Mosquitto - An open-source and popular MQTT Broker. Initially, Mosquitto is installed with no security, meaning anyone on the network can publish and subscribe without a password. Since the Pi is running a private password protected network, we’ll be fine keeping the default MQTT settings. # is running on. Localhost will work fine, otherwise use the Broker IP. # Topics are how MQTT organize data. Have the script running before moving to the next step. note: This example is a modified version of a PubSubClient example. Open the serial monitor and set the baud to 115200. You should see information about the device connecting to the wifi network, MQTT broker, and publishing data. Over on your Pi, you should see data coming in too! In an SSH session with your Pi (plugged into your computer’s USB) install the Hologram SDK. This may take a few minutes. Edit the newly created file. Near the top add an import for the Hologram SDK, instantiate Hologram and connect to the network. Add a Hologram SDK sendMessage() to the bottom of the on_message() function. See the gateway_cell.py file in the GitHub repository to check your work. We’re about to plug in the cellular modem (do not do it yet). Up until now, we’ve been running the Pi from USB power. Now with the modem attached we need more juice! Find a 5.1v 2.5A power supply and connect it to the power outlet on the Pi. Up until now, we’ve been accessing the Pi through SSH using USB. Soon we’ll need to use the USB port for the Nova. So how will we SSH into the Pi? We’ll use the Pi’s WiFi network! Close the current SSH session by typing exit and disconnect the USB cable. Now connect your development computer to the Pi’s WiFi. We’ll lose internet connectivity and for the next few moments that will be ok. Being connected to the friendly-raspberry WiFi network, you can now reconnect through SSH the same as you did before. Time to connect the Hologram Nova. If you have not done so already, disconnect your computer from the USB port on the Pi and in its place plug in the Hologram Nova with a USB-A to USB Micro adaptor. Now wait for the Nova to show one solid LED, and one blinking LED. This means the Nova has detected an available network. If you never get a blinking LED then disconnect the Nova and double check the SIM is inserted correctly, and the antenna is attached. With the Nova plugged into the Pi run the new script we made above. The previous Nodes should still be running and will automatically connect once the script starts running. You should be able to see serial debug messages. If you see the following, then chances are we have done everything correctly! P.S. While the script is running the blinking light on the Nova should become solid. This is to show we are connected to a network and have established a TCP session. Close the SSH session by typing exit. This will also kill the script. Disconnect your main computer form the Pi's WiFi and connect to your home network. Go to the Hologram web console to see your data in the cloud! 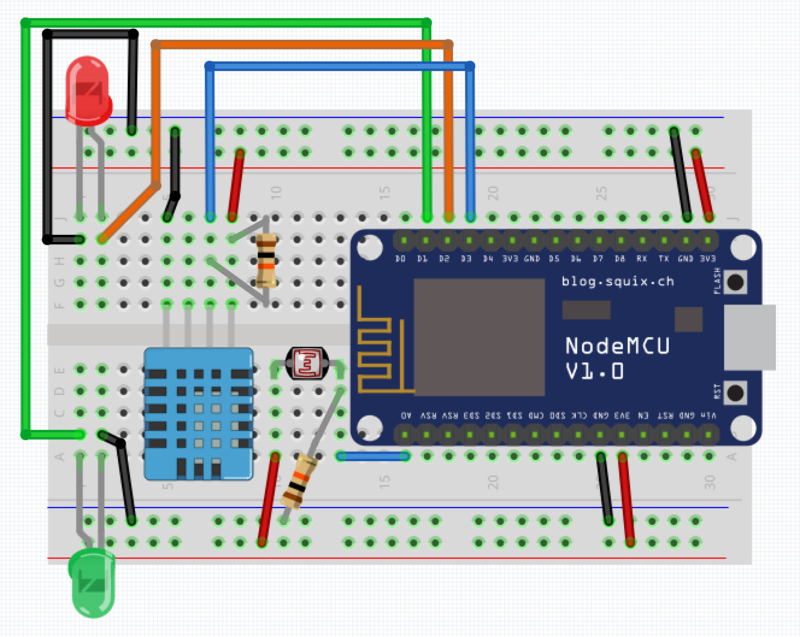 With the skills you've learned above lets build a network of environmental sensors (light, temperature, and humidity). Code: The code below expands from the example we used in step 5.0. We add logic to read sensors and format their results plus sprinkle in some logic to control two LEDs (red and green). The LEDs will help us determine the connection status of the device without needing access to the serial console. The gateway python code is nearly untouched. we just make a few tweaks to the MQTT topic. Run the code as we did before and check the Hologram console to see the code in the cloud. If everything works then I'd recommend setting your python script to automatically run after the Pi boots. You can learn the different ways to accomplish that from this great blog post.